“THANKS FOR LISTENING TO ALL THAT MADNESS.” Colin Grossbier performs expansive ambient soundscapes at nearly every Tuesday night open mic at The Plus. He’s self-released four full albums for his solo project Nostromo. It’s the middle of August in the summer of 2017 and Colin Grossbier is apologizing. 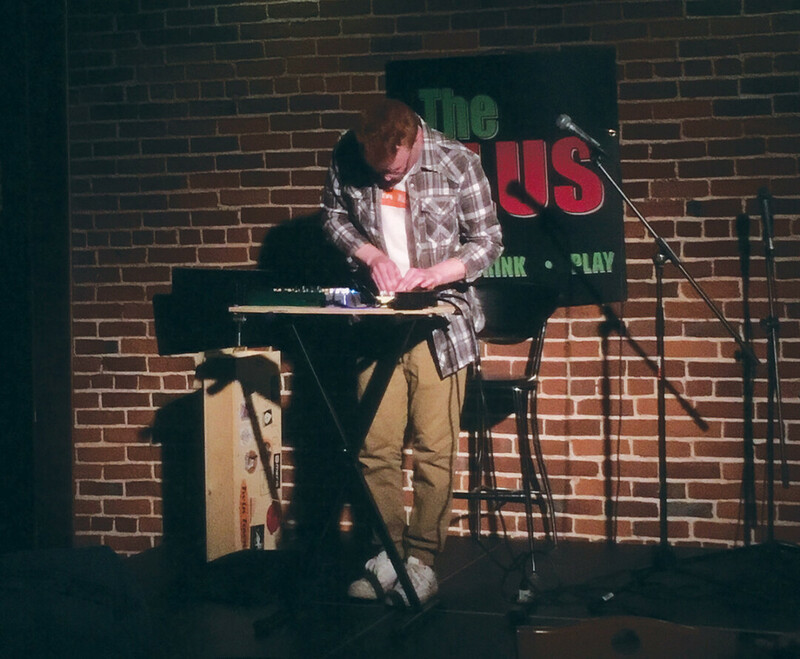 The 18 year old musician is standing on stage downtown at The Plus’ open mic behind his guitar and its plethora of pedals. The Elk Mound native spends just about every Tuesday night there. Below his short red hair and glasses there’s a smile on his face. Colin has just spent the last 10 minutes building a constant wall of intricate, interwoven sound. He’s finally taken the time to look up at the crowd, and is now aware just how happy they were to listen in on the world he was creating. While they were focused on him, he was making an escape. In fact, it’s easy for anyone to forget what was bothering them at a Grossbier performance. Colin is a looper, using repeating and overlaid tracks made on his guitar and accompanying pedalboard to craft hypnotic and dense soundscapes. Starting with one phrase, he adds another. Another beat, and he’s placed another melody on top. It begins to sound like a room of overlapping conversation, with each note adding to the chaos and order alike. At times, it feels like you’ve been dropped into a decades-old sci-fi flick, looking out on some dystopian landscape, waiting on the next unknown. Then the music stops. You’re in your chair at the bar with your cheese curds and Coors Lite again. It’s 2018 now. Grossbier has spent countless hours on stage, self-released four albums, and found a new name: Nostromo. Taken from the cargo ship on 1979’s Alien, it feels fitting. In fact, he got his first work in music writing for Elk Mound’s filmmaking club. Each and every time he stands on stage he aims to transport you to somewhere of his creation. “Someone once told me my music is like a painting, with different layers and colors,” he said. “I love that people enjoy it.” He no longer calls it madness, and he’s no longer apologizing. He’s learned that we’re happy to ride along where his music takes us, and we can’t wait for what’s next. You can listen to Nostromo’s music on Bandcamp at coling.bandcamp.com.